Summertime is full of vacations and fun. Yet, somehow I still hear the dreaded words, “I’m BORED!” roll off the tongues of children everywhere. 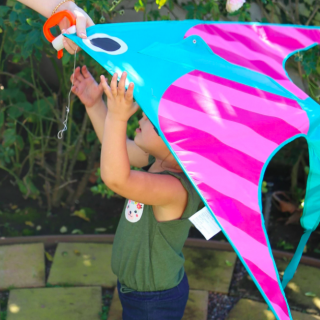 If you are looking for the perfect ways to keep your kids engaged in play this summer, look no further! There is something here for everyone’s summer entertainment. Can you imagine your kids playing a game that has them working together as a team? No more fighting or tears or thrown pieces from the sore loser of the bunch. Peaceable Kingdom games are fun, built around clever themes, and made to be cooperative meaning you play together as a team to work against the game board! This summer, we’ll be challenging each other with some of Peaceable Kingdom’s newest cooperative game titles. Friends and Neighbors: The Helping Game that is built around recognizing and naming emotions while also practicing helping. Or start with a game that builds an intro to strategy and planning ahead with Lucky Dogs Dice Game. Another cute one is Memory Palace where together you create stories — and try to remember where you placed the animals along the way! My kids thought that one was so funny! When you are ready for a game for the whole family, try ListMania or You Guessed It! Both are perfect for a conversation starter at the dinner table or for playing on your summer road trips! It is amazing just how quickly kids change and grow! 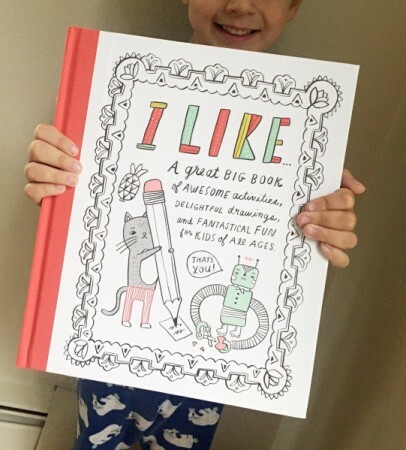 This summer take a snap shot of who they are right now with Compendium’s newest title: I Like… this whimsically illustrated activity book that encourages kids to draw and write about everything they like. Each page brings a new and fun adventure that inspires humor, personal reflection, and positivity. I Like… is an imaginative activity book that lets kids create the “old fashioned” way with paper and pencil. Encourage your child to spend a little time each day, unplugged. Once completed, this hardcover book becomes a keepsake snapshot of your child’s incredible one-of-a-kind personality. Perfect for remember just the way they were this summer. Compendium has a whole collection of amazing books to check out this summer in addition to this one! My kids love to have time to use the iPad, but I would prefer that their screen time be spent leaning new skills and playing games that help them think! The Explorer X is an interactive learning system that uses augmented reality (AR) to turn a table top into an immersive playing field for kids. The Explorer X allows the iPad to pick up movements of the game pieces and feeds this info back into the iPad in real time. Paired with the STEM Lab: Little Engineer app, my kids can learn the fundamentals of coding in an entertaining, engaging fashion. STEM Lab: Little Engineer allows children to build maps and passages that help the main character, Q, fix robots. The Little Engineer package includes the Explorer X system (iPad stand and front-facing camera attachment), a downloadable app and 15 child-friendly coding blocks. The Explorer X is compatible with iPad2 and later. The Explorer X and Little Engineer bundle retails for $79. For more info, visit www.STEMlabgames.com. 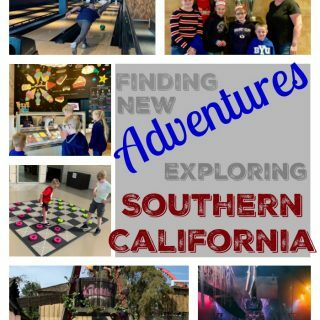 There are lots of fun things to do right in your own hometown. You can visit your local zoo, go to a sporting event, play a round of mini golf, or even go rock climbing. All of these fun activities can get expensive, quick. You can have a lot of fun around your town and save tons of money with Pogo Pass! 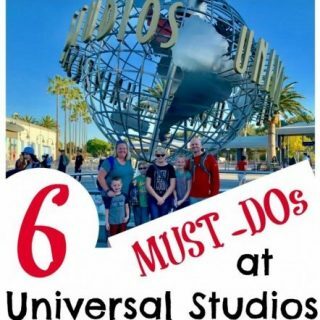 The pass gives admissions into popular local attractions and sporting events all for one low price! Each pass is valid for a full year from the time of purchase. Pogo Pass is currently available for Phoenix, AZ; San Antonio, TX; Austin/Waco, TX; Dallas/Ft. Worth, TX; and Las Vegas, NV. Grab a Pogo Pass at 60% off with the promo code amomstake and get a summer access pass for just $39.98. Challenge your crew to keep using their brains and avoid summer slide with games! It doesn’t have to be boring to practice math or strategy during summer break, Gamewright has lots of fun new titles that can challenge, and keep them having fun and entertained. Try out Baba Yaga that will have them concocting spells and potions, if they can collect the right combinations. Dragonwood, a daring dice game that will have them thinking about probability and math skills as they earn dice to battle the foes in this simple-to-learn, yet engaging game. Outfoxed will have the family teaming up to gather clues and figure out the whodunit with lots of reasoning and deduction involved. And when you’re ready to turn to something light and fun for the whole group, Sushi Go Party! plays with up to 8 people in just 30 minutes! Each of these Gamewright games can be played with as few as two players, making it great for siblings to entertain each other. In a brand new personalize book from Lost My Name, your child can take a trip that is literally, out of this world with The Incredible Intergalactic Journey Home. When a lemonade spill causes their computers to stop working, your child and their alien friend must find a way back home from outer space! Your child will laugh and love seeing themselves portrayed as the main character in the story. Complete with an illustrated character that looks like them, featuring their actual name, familiar landmarks and finally their home, this is a book your kids will beg to read over and over. 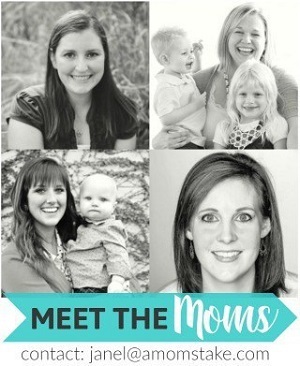 All three of my children have called a different state home during their early lives, I had a book made for each of them that takes them home to the first house they called home, one in Utah, one in Arizona, and one in Alaska. Such a fun way to celebrate their differences! Your summer adventure really takes off with The Incredible Intergalactic Journey Home. I love that playing games together gives a place to have fun and open up communication. Blue Orange games has some really fun titles great for a variety of ages. Our latest favorite is Draw 4: Dig for Dinos. 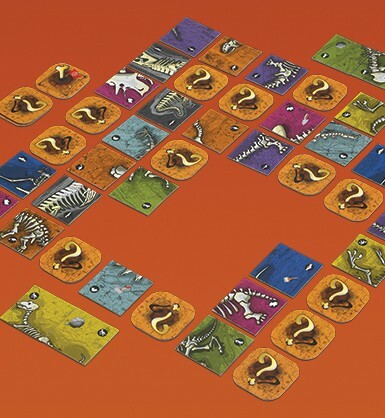 You work to collect dinosaur bones as you excavate tiles from the board. Collect a full set of four dino tiles to protect your collection from action tiles! Aztak is a fun game that blends mahjong and dominoes by trying to get rid of all of your tiles first by making matches and blocking other players. Go for a game with more strategy in New York 1901 where you construct, demolish, and then rebuild the New York skyline. I’m always on the lookout for fun 2-player games for when we can’t round up the whole group to play, and so I’m excited about Longhorn that’s made specifically for just two players! You’ll play together as two feared dueling outlaws in an attempt to steal cattle and gold and even attempt to get your opponent arrest! Summer may have just started for some, but school is already on the minds of others! Keep a positive outlook for the new school year with these awesome titles from HarperCollins Children’s Books. On The First Day of Kindergarten by Tish Rabe has been a hit at our house with a new kindergartner starting school in the fall. A new twist on “The Twelve Days Of Christmas”, it is fun to read and will have your little one convinced Kindergarten is the hot spot to be! Pete the Cat’s Got Class by James Dean, Pete is always a favorite at our house, and in this story he finds a way to help his struggling friend learn to love math. In Rappy Goes to School By Dan Gutman, Rappy is so excited to go to school! When he spots another classmate being bullied, he finds the courage to stand up for them and makes new friends in the process. Playing school has never been more fun than with Winnie & Waldorf: Disobedience School by Kati Hites, Winne is determined to fix Waldorfs behavior by enrolling him in her school for disobedient dogs! Do you love to play games, but don’t have someone to play with you? Then turn to GameHouse where you can find a huge variety of fun and entertaining games. They have 1000+ games and counting, so you’ll never run out of games to play. There’s something for you whether you’re just looking for relaxation, or need a fun way to kill time, or even looking for a challenge! GameHouse is famous for their heartwarming games like the Delicious, Fabulous, and Heart’s Medicine series. Two favorites are Jewel Quest and Picket Fences. Both are super unique games that had me completely addicted. Each game has a free 1-hour trial to make sure it’s a game you’ll enjoy before you commit, and unlock unlimited play on every GameHouse game for just $9.99/month. Children learn best through play. American Girl is excited to announce the debut of WellieWishers, an all-new content & doll lifestyle brand for girls ages 5 to 7. With a collection of dolls and books, your little girl will love to read about their favorite new friends. The adorable group of WellieWishers friends–Willa, Kendall, Ashlyn, Emerson, and Camille–imagine and play in an enchanted neighborhood garden supervised by Aunt Miranda. Through their heartwarming and humorous adventures, the WellieWishers help a girl to learn how to “stand in another person’s wellies” to discover the skills of empathy, kindness, and compassion that will help her be a good friend. I love books and toys that encourage my kids to think outside of themselves, which is exactly what the WellieWishers do! With screen time being such a huge draw for children, I always want to be sure my devices are safe for little hands, especially with all the summer travel we are doing! Logitech has your iPad covered with their Blok family of cases. Choose from the Blok shell, a light weight case with screen protector to prevent scratches. The Blok Case combines the Blok Shell with the added protection of a caver that is also a stand for hands-free viewing. Or the Blok Keyboard Case, a combination of the Shell and Case with an added detachable Bluetooth keyboard. All three Blok cases are excellent choices and you can rest assured your iPad is safe in the hands of your little ones! If you have teens or tweens in your home, you’ll know how easy it is for them to pour hours upon hours into movies, TV series, or video games. Instead, pull out a game that will challenge them and encourage face time and relationship building – whether with you or their group of friends. Rio Grande Games has two fun new games perfect for this crowd. 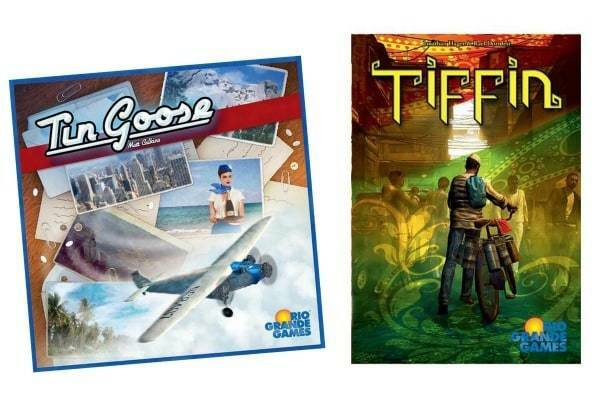 In Tin Goose, players compete to build an airline business from the ground up. You’ll need to manage purchasing planes and building networks and keep your strategy on your toes for when twists come up! Or try your hand at Tiffin, a game set in a bustling financial capital: Mumbai, India. Players take on the roll of delivering home-cooked meals along different routes to waiting customers. Both of these fun game will hopefully kick start your teens with some business savvy, too. With the release of Disney Pixar’s Finding Dory, the deep blue sea is sure to be on every child’s mind this summer. Encourage your kids to “dive in” and learn all about the REAL characters from the hotly anticipated movie with these new titles from Nat Geo Kids Books! Ocean Animals: Who’s Who in the Deep Blue is an oversized book and it needs to be! Featuring huge, stunning underwater photographs this book covers it all — from life in coral reefs to sharks and rays, to bizarre creatures of the deep and even sea birds — and all the favorites from Finding Dory including, sea lions, octopus, beluga whales, whale sharks and of course clown fish and Dory herself — blue tangs! Ocean Animals Sticker Activity Book has over 1,000 cool stickers of the most popular, adorable, ferocious and weird ocean animals, like dolphins, coral, fish, sea turtles, seals and more. Also included are skill-building puzzles and mazes, spelling and pattern games, drawing, photos, facts, and other activities that will keep kids you entertained (and learning) for hours on end. Enter to win your own Dory Pack including a Dory plush and both Ocean titles below. Enter to Win a FunPass & Nat Geo Kids Dory Prize Pack! We go swimming, hiking and biking in the summer. They go to day camp, we arrange playdates, go to the library, swimming, the park. We try to take park trips and day trips to the lake often. We go to the beach or play in the sprinkler. We go swimming, to the park , play board games. I keep my family entertained during the summer by having family activities. We like to go hiking, take walks on nature trail, go swimming and play board games. We do alot of arts ‘n crafts. It keeps boredom at bay. My family goes swimming, hiking, and bike riding at the local greenbelt. Lots of DVDs and outdoor activities as well! we like to do bike rides and hikes. summer is our favorite time of year. We stay busy but also relax and take it easy some days. We like to swim in the pool, make smores by the firepit, tend to our garden, play soccer and basketball, ride bikes, play freeze tag, play board games, read books and go to the local drive in on family night. I like to take my grandbaby on walks around the lake to explore. We also have a vacation coming up at the beach. We go to the beach during the summer. We plan family day trips to the library, zoo, park, pool, etc. to keep the kids entertained during the summer. When we are at home we do crafts, cook, read, listen to music, watch movies, play games, bike ride, etc. We enroll her in summer activities and make sure she has plenty to do at home (books, etc)! We go to concerts, museums, & zoos. We spend as much time outside as possible – they have fun and it wears them out! It’s tough!! I do outside activities, and indoor too. We do crafts, bake, nature scavenger hunts, swim, play games but it’s still tough! This would be great! Thanks so much for the opportunity! You got my attention early on when you talked about a game that is fun and has the children working together as a team. There are a lot of great ideas here. I am glad I read about these products. My daughter is learning to read and she loves books. She also loves to swim like a mermaid in the summer. We like to be outside so we like to keep active and go to fests, or the beach, ect. I’m in love with those Wellie Wishers! I love the idea of these toys and they look so appropriate for kids! I take them swimming a lot or bake with them. Constant trips to the park and beach!!! Going on daily local trips. I love Gamewright products! I’m also really into play that teaches at the same time as entertains. 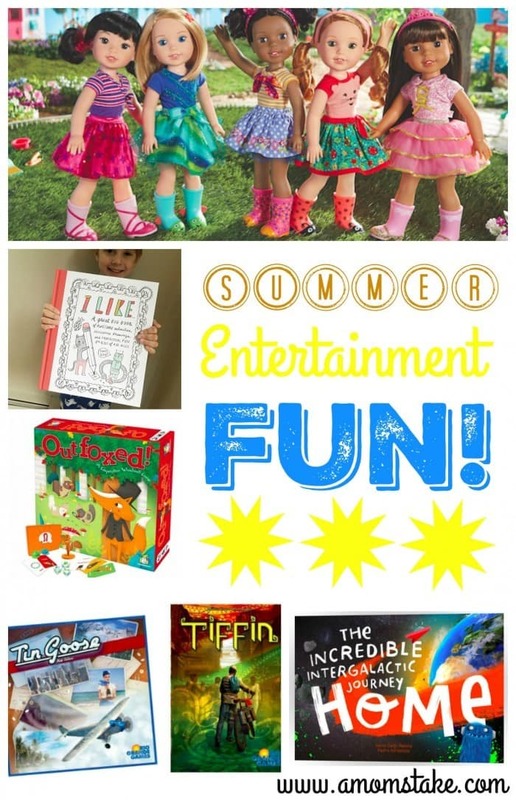 I love how your list of summer fun activities includes so many educational choices. I think the STEM sets sound awesome! this giveaway looks great. 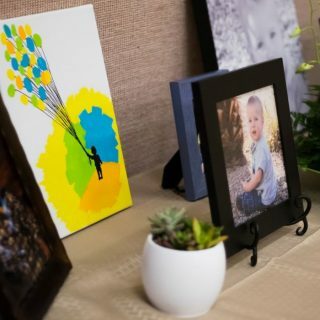 i saw a few items listed that i know my friends kids would love. Those look like lots of fun, what great prizes. Good luck to everyone entering! I ave already hared “I’m bored” 100 times since summer started. This will be great to have for the next time I hear that. This is a lot of information and different varieties of things. So many great options to entertain the kids and not have it be all ‘fluff’. I’m all for things that get them engaged instead of vegging out. There is a lot here that we have not played yet! Good thing we have a full summer yet to play them! We have played a few games from the Peaceable Kingdom and those were so fun! I would love to get the books about starting school for my son. He starts pre-K this year and it will be the first time he’s been away from us, aside from when he was a baby. I want him to be prepared and positive about anything school related. My daughter goes to a STEM school, so any games or toys that are STEM inspired, she will love. This is a great list! The Explorer X sounds awesome. My youngest son would LOVE that.